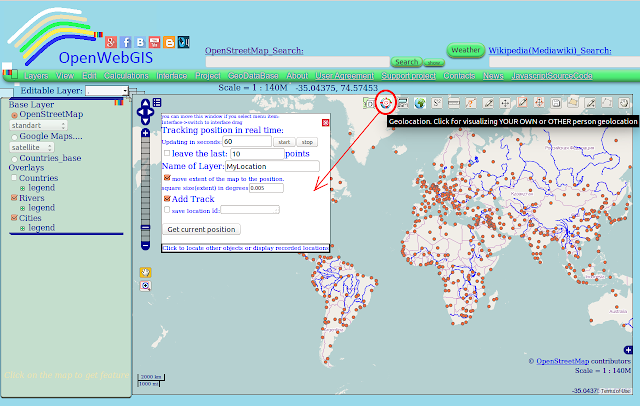 You can collect sensor data and refer them to the geographical coordinates in OpenWebGIS. To do this, first turn on geolocation of your device . 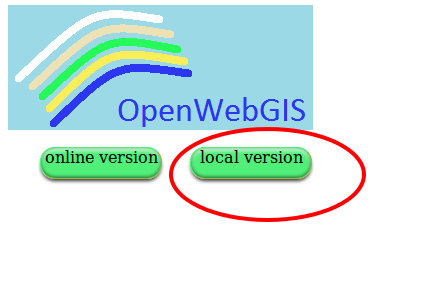 Then you need to run on your device OpenWebGIS version for Android, after that select in the first window - local version (see Figure 1). 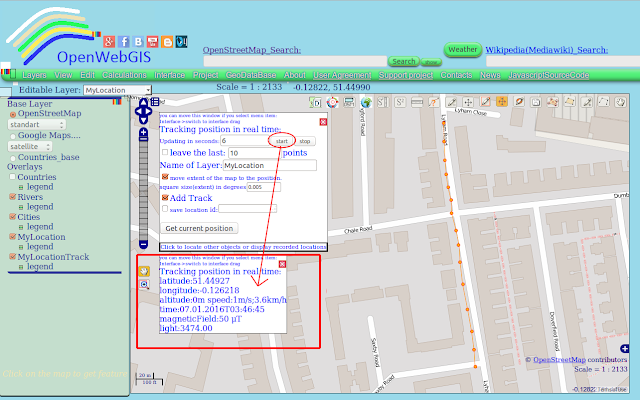 Then click on the button at the top right corner of the map (see Figure 2), then a window will appear with the settings geolocation. Set the desired time «Updating in seconds» and click on «start» button. After that, new layers will be added to the list of layers. 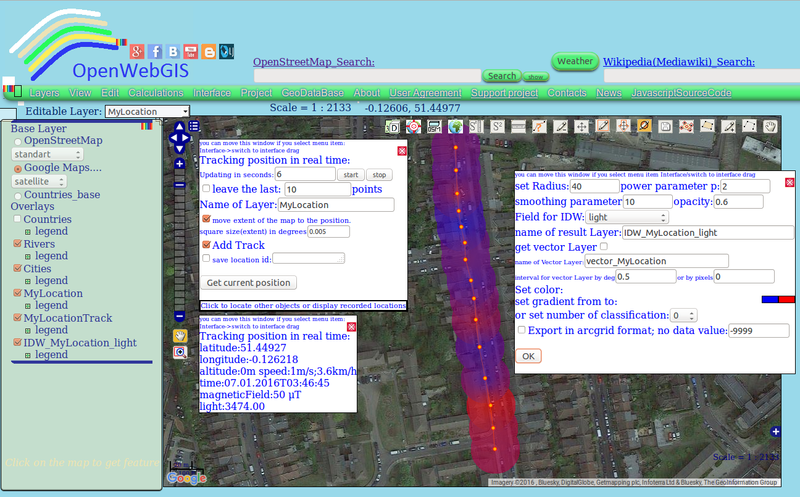 Points and a track of your movements will be added to these new layers. The additional popup window will also appear, which will show and update geolocation information and sensor data - light (illumination), magnetic field and temperature (see Figure 3), and other sensors outputs will be added to the attributes of the respective layer (see Figure 4). 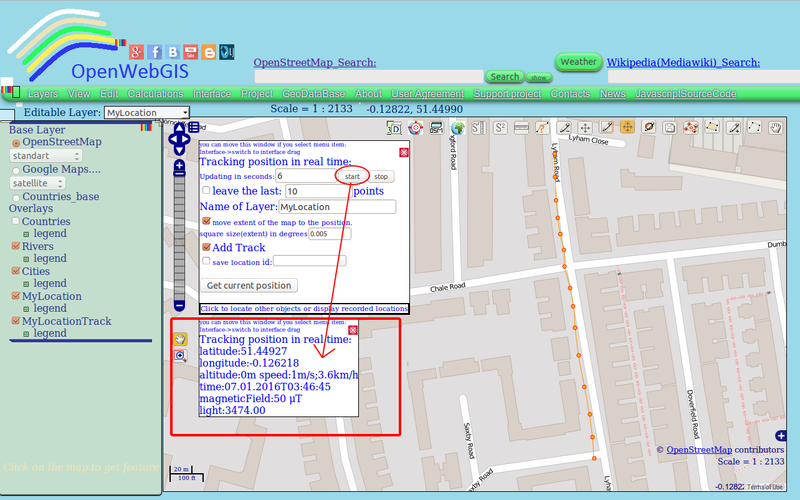 In these figures the sensors data is given as an example but is not real. All data recorded at each point, you can see if you select Layer's name ("MyLocation" - in our case) in the dropdown list "Editable Layer". 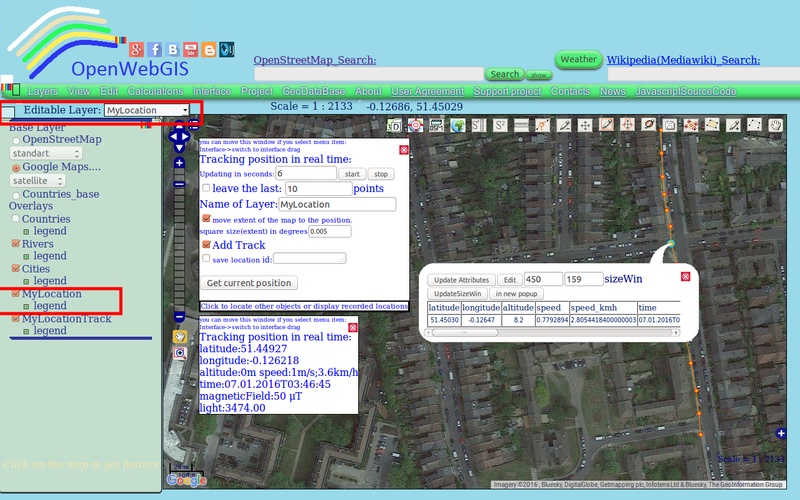 Then click (on the map) on the point you are interested in. 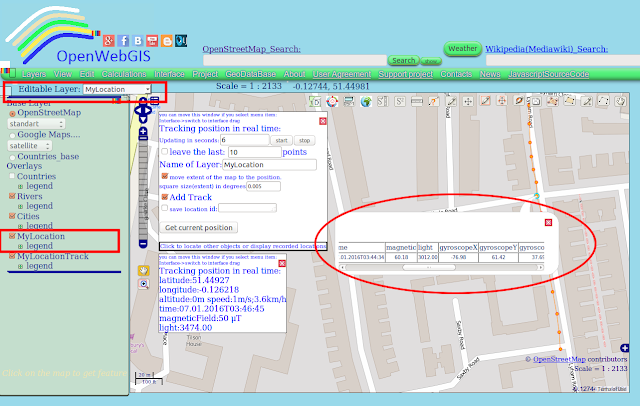 The values of all attributes of the point you can see by hovering the cursor over it and clicking on it (if while hovering over a feature, it is not activated, then move the map a little bit and then again hover the cursor). After clicking on the feature you are interested in , the pop-up window will be opened. In this window you will see all layer attributes (see Figure 5). There is another way to see all data: if you open the attribute table using the menu item "Edit-> Open attribute table" (see Figure 6). 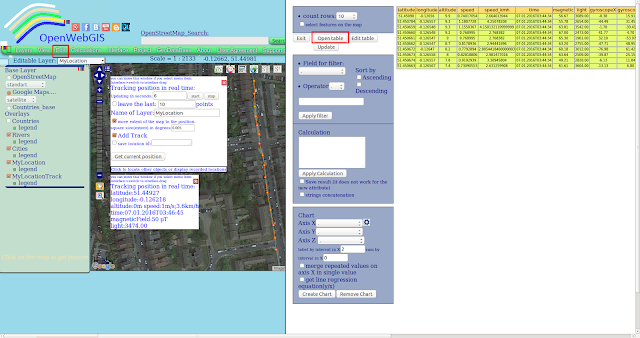 Figure 6 -Open the attribute table using the menu item "Edit-> Open attribute table"
At the moment in OpenWebGIS you can automatically collect data of the following sensors: accelerometer, gyroscope, light, temperature, magnetic field, pressure, rotation vector. The presence or absence of any of these sensors is determined by OpenWebGIS automatically. Android version of OpenWebGIS is created for operating system Android version 4.4 and later. Speed of motion is determined only if the geolocation is set via GPS. Ready to use Android apk file for your mobile devices is available from GitHub, for downloading at Itch.io, Google Drive, Mobango.com and also at other app stores. Last new version always for your mobile devices is available for downloading at itch.io , Google Drive, GitHub. The OpenWebGIS blog and full list of articles about OpenWebGIS provide a lot of information about possibilities of OpenWebGIS.